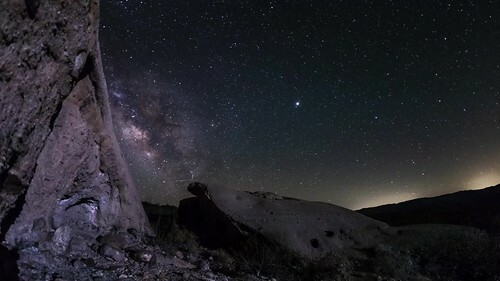 The Milky Way drifts between some sandstone rocks among the Wind Caves in the Anza-Borrego Desert. I shot this sequence by taking 267 exposures with my Canon 6D and Sigma 15mm EX DG lens at 15 sec f/2.8 ISO 3200. I illuminated the sandstone caves using a cheap LumeCube knockoff: NEEWER 160 LED CN-160 Dimmable Ultra High Power LED Light. I positioned the light on a hill in the distance behind my camera. The weather conditions were prefect for shooting this night - almost no wind, clear skies, and very low humidity. Background music is a short sample of "Space Elves" by Lobo Loco.